With the canonization of Blessed John Paul II taking place on Divine Mercy Sunday, the world’s attention turns to the legacy of the beloved former pontiff. Many will posit his theology of the body, travels across the globe or the record number of new saints as underpinnings of his papacy. However, there’s one imprint that not only separates him from the others who sat on the Chair of Peter, but will shape the Church for decades to come: his love of arts and specifically, creative writing. To be sure, the young, kayaking priest never penned a novel nor saw his plays performed on Broadway, but the playwright and poet loved the humanities and encouraged the Church at large to be creators and consumers of all that is good beautiful and true. Perhaps that’s why the John Paul II International Film Festival honors John Paul the Great and attracts independent films from across the globe. It could also be the reason why so many centers that bear his name are screening films, hosting authors or contributing to the arts in profound ways. But what’s even more amazing is the widespread proliferation of next-generation Catholic authors, who are taking up their keyboards and quills in the culture war. One thing here is for certain: a Catholic literary revival is under way and perhaps John Paul II should be its patron saint. As a prime example, take a look at The Tuscany Prize, a cash offering for unpublished and self-published works of Catholic fiction that rivals its secular counterparts (at least for short stories). The prize, made available through Tuscany Press, gives writers a chance to compete for a meaningful recognition of $5,000 for the best novel, $3,000 for the best young adult novel and $1,000 for the best short story with additional prize money for runners-up. Now in its second year, the Tuscany Prize has attracted hundreds and hundreds of works, some of which have gone on to publication and are achieving notoriety among top blogs and garnering positive reviews on everything from Amazon to Goodreads. This is the type of evangelization to which Karol Wojtyla would have very much been attracted—even before becoming the Bishop of Rome. Why? Because this is the stuff that works. The New Evangelization isn’t about preaching to the choir. It’s about living. It’s about creating. For authors, it should be about writing stories that capture the imagination and inspire the souls of those who do not yet know the love of God. For readers, it should be about consuming the beauty in visual, audio or literary form that speaks to the soul through vivid imagery and an awe at the grandeur of God—whether intuitively or explicitly. A friend recently confided in me that the Church doesn’t need more theologians or moral authorities. We, thankfully, have hundreds of ‘mini Scott Hahns but so few Flannery O’Connors. 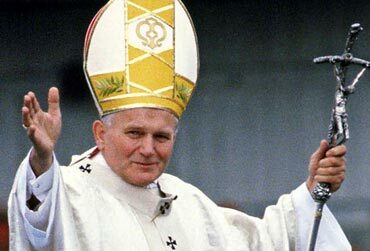 Perhaps with his canonization, soon-to-be Saint John Paul II will really get to work and facilitate an outpouring of grace that will spur the next generation of G.K. Chestertons and J.R.R. Tolkiens. After all, who doesn’t love a happy ending? Peter Mongeau is the founder & publisher of Tuscany Press, home of the Tuscany Prize and publisher of CatholicFiction.net, the home for a new Catholic literary revival.